I didn't start off using breeding runs. I still don't use them exclusively. Knowing what I know now, though, I don't think I could give them up. 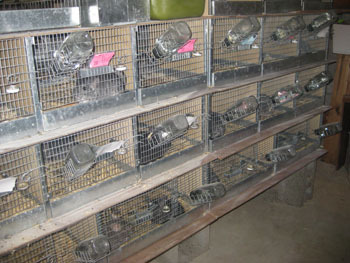 Breeding runs are usually 3-8 cages connected by a square tunnel at the top and back of each cage. This tunnel allows the male to access each cage through a hole in the back. The females wear a collar so they cannot enter the tunnel. Why use them? First off, they are safe. Breeding females should be in a single level cage for the safety of the kits (they can climb up, but not down). Also, if necessary, the females can be kept from interacting for the safety of the kits. If you use the breeding collars the female cannot leave its "hole", but if you remove it they have free reign through the run. Second, runs save a great deal of money. They are reasonably priced and they allow you to use one quality male with up to six (or more!) females. Creating a breeding program with one male for each female can really add up. Some argue they are too small to keep chinchillas in all the time. That's probably true. If you can't offer time out of the breeding runs you can certainly give them time in larger, multi-leveled cages. I like to give the chinchillas free time in the room every week as I change their cages. The best alternative to breeding runs is a colony setup (one male and several females in a single cage). This is a fantastic setup when it works. Just be aware that conflicts between the chinchillas can emerge, even after some time. This can lead to disastrous results (deaths). Colony caging is for the experienced breeder who can safely assess the temperament of their chinchilllas. You can get breeding runs from the large breeders, or maybe even make one yourself! We'll try to build some breeding runs this summer, and you'll be able to follow our journey!